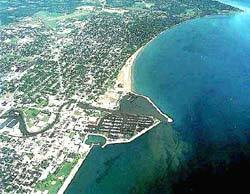 Aerial photo of Racine from Lake Michigan. Racine is located on Lake Michigan, at the mouth of the Root River. It is approximately 30 miles south of Milwaukee and 60 miles north of Chicago, Illinois.Incorporated in 1848, Racine is a port of entry, and its manufactures include farm machinery, processed foods, automobile parts, machine tools, floor wax, and electrical equipment. The first permanent settlement was established in 1834. Improvement of the harbor (c.1844) and the coming of the railroad (1855) brought industrial growth. Three buildings in Racine were designed by Frank Lloyd Wright, and the reliefs at the county courthouse were designed by Carl Milles. The Racine Zoological Gardens is one of only thirteen free admission accredited zoos left in the entire country. Located on the north side of downtown, covering 32 acres, the zoo is home to over 250 animals representing 76 species. The Wind Point Lighthouse has become a familiar icon of the Racine area, thanks to the many artists and photographers who have captured its beauty. Built in 1880 at a total cost of $100,000 the 112-foot lighthouse helped make Racine a safe harbor. Before the lighthouse’s beacon began guiding Lake Michigan boaters, a lone tree served as a landmark for sailors off the Point. It is believed to be the longest standing lighthouse on the Great Lakes. Today, the lighthouse buildings serve as municipal offices for the Village of Wind Point. The lighthouse interior is not open to the public, but visitors can stroll the grounds and enjoy the view.